The deathly silence is about to be broken. She disliked the company of others and death did little to warm her spirit. She had led an independent life and she faced death in much the same way. She was finally alone, finally free from the mindless babble of others, at least that's what she thought. May Elizabeth Trump was the rarest of spirits and she was none too happy about it either. She was a dead medium, a ghost who can speak with the living, and her services were to become in great demand. Flung into the limelight and smothered with unwanted attention, May soon discovers that it is not only ghosts with long awaited messages that have taken an interest in her. Something dark was lurking in the shadows, stalking her. Even the dead are not left to rest in peace. Dead Medium: A humorous, supernatural mystery and a unique vision of life after death. Not your average ghost story. "The strangest things happen when you're dead." - May Elizabeth Trump. "This may come as a shock to you, Mr. Tailor, but ghost stories don‘t work on ghosts!" - Gary Reed. “On the really quiet nights, I thought you knew it was me who made the Ouija board spell cake.” - Margaret. May Elizabeth Trump enjoyed her solitude and did not put up with nonsense. When she suddenly died, she was left to figure out what was next. May was surprised that she had not moved on to another place and that she was still on earth, though no one seemed to be able to see her or hear her. She decided to go in search of someone who might be able to hear her, when she finds Penny, another recently departed. May decides that Penny needs her help with her daughter, Chloe who is still among the living and will go to great lengths to help her keep her house and continue her education. May is surprised to find that the living can hear her even if they can’t hear other ghosts. She figures her only shot at getting the living to help her on her quest is to visit her friend Margaret, who is part of a group of old ladies who like to try to commune with the dead. 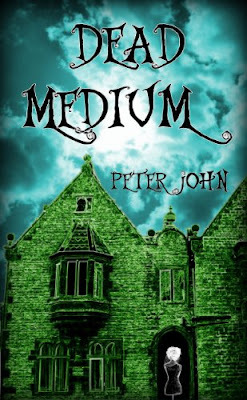 A funny paranormal comedy that puts a new spin on ghosts, mediums and what may be in the afterlife. I sometimes struggle when reading a book from a writer from another country, and this was no different. Words have different meanings that cause me to stumble but it didn’t detract too much from the whole of the story. I did not care for the way that George’s character was betrayed. He was from 100 years ago and his speech reflected so. Due to this fact I didn’t follow everything he was trying to portray and felt that at times I might have missed something significant. A nice mix of young and old showed the growth that people can make even when they aren’t trying. Peter John was born in Bromley Kent, England in 1973. He gained an interest in creative writing at the age of 14 and was published during the 1990's in several poetry anthologies. Happily Married to Jo since 1996 and currently living in Sidcup Kent, not so far from the tree.